Even if the fish has been cleaned and decapitated, (at this point, if you wish to remove the tail and fins - do so with a good pair of scissors) wash the fish thoroughly, inside and out. Make sure the scales have been removed - if not- scrape the fish down with a knife (going against the grain) to remove any scale left on and set your fish aside to dry. 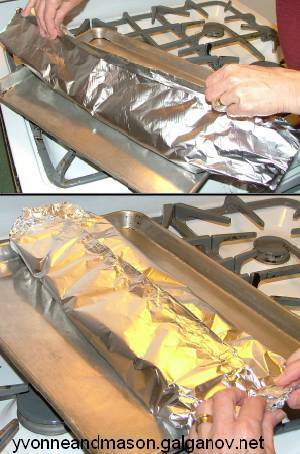 Set, onto your work surface, a piece of foil large enough to wrap the fish entirely - in a single piece - creating a foil pouch. 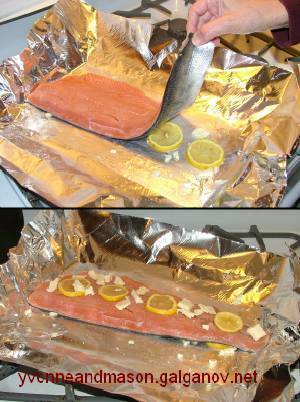 Lay slivers of butter along the foil - the length of the fish every 1/2 inch (12mm) or so. It is not necessary to cover the length completely. Lay the fish on top of the butter. Then put slivers of butter into the cavity of the fish. In the cavity, on the butter put slices of lemon - about 1/16 inch (3mm) thick. On top of the fish put slivers of butter (again) and slices of lemon on top of the butter (again). Being careful not to tear the foil, wrap the fish so that it makes a completely closed pocket with seams at the top to prevent leaking. A double folded seam helps to seal the pouch. This layer of foil will always leak (unless using a high quality, heavy duty foil - and even, sometimes, then) so we usually take a second piece of foil and wrap the bundle again - rolling up the sides a little (heavy duty foil may be more effective when using a single ply of foil). Place your wrapped fish on a pan, put it into a hot oven (375F - 190C) and bake for about 25 minutes/pound (1/2 hr per 500 gram) eg: a 3 lb (775 g) fish bakes for about 1 hour 15 minutes. We usually bake it for an additional 5 to 10 minutes. A warning about fish: Even salmon, with its large bones, should cause you to be careful with children. Never give a youngster salmon from the tail. The bones are larger and easier to see near the head. Salmon is probably one of the simplest, "fancy" main courses. In this recipe your fish is cooked in lemon-butter imparting the fresh, sweet-tart flavour of these two ingredients. While this is not, in fact, a poached salmon it does cook in it's own juices - with lemon and butter imparting a wonderful flavour and texture to the fish but it is more "pouched" than "poached". 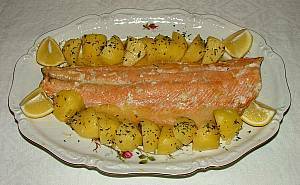 This method to prepare salmon produces a wonderful flaky, flavourful fish dish. In many parts of Canada one can, at certain times of year, buy a frozen salmon that has been gutted and the head removed. It takes under 15 minutes to prepare for the oven. By comparison, the salad and the rice that we usually have with this fish is a big job. A 2 1/2 to 3 lb salmon will feed 4 people. This recipe will work well with almost any kind of fish. While Mason doesn't care much either way, Yvonne is repulsed by fins and tails so we always cut these extremities off. Some people think it looks nicer (fancier) with them on but, on or off, the taste is not affected.